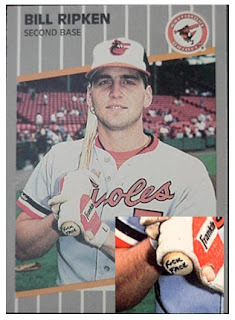 Had the folks at Fleer caught what was written on the bat... it's extremely unlikely that we'd be talking about the 20th anniversary of any moment in the baseball career of Billy Ripken. After all, the son of Cal Sr., once his manager, and the brother of Cal Jr., his teammate, was known more for his glove in a 12-year Major League Baseball career than for his bat. His batting average was .247 and he knocked in a total of 220 RBI. But in January of 1989, Billy Ripken, scheduled to be a five cent common in the 1989 Fleer set, ignited the hobby already entering its prime with the debut of the very first Upper Deck set. Packs of Fleer hit hobby stores right after New Year's and, within two weeks, everyone had to have their hands on card No. 616, Billy Ripken. It was the bat that he designated to use only in batting practice. It was the bat that had "F--K FACE" written on the knob, the obscenity in its full four-letter glory. ESPN's Tim Kurkjian, then working for the Baltimore Sun, got to Ripken and Fleer first. Fleer's president Vincent Murray claimed that hadn't seen it before and that the company was doing all it could to correct the error immediately. Ripken told Kurkjian he was angry and disappointed. "It appears I was targeted (by teammates)," Ripken told Kurkjian. "I know I'm kind of a jerk at times. I know I'm a little off. But this is going too far." What ensued was absolute chaos and—as the "error" card's price rose to nearly $500—there were some amazing stories. A kid, who happened to be a fan of Ripken, had purchased a huge lot of No. 616's from a dealer for $50. When the curse was found, the new worth of the cards was closer to $20,000. There was the story of one kid who sued another kid for convincing him to sell his Billy Ripken for $1, without knowing the curse was on the bat. And the tale of the Geraldo show entitled "Men who write bad things in public places," when an audience member claimed it was he who wrote the obscenity on Ripken's bat. "I got a dozen bats in front of my locker during the 1988 season. I pulled the bats out, model R161, and noticed--because of the grain patterns--that they were too heavy. But I decided I'd use one of them, at the very least, for my batting practice bat." "Now I had to write something on the bat. At Memorial Stadium, the bat room was not too close to the clubhouse, so I wanted to write something that I could find immediately if I looked up and it was 4:44 and I had to get out there on the field a minute later and not be late. There were five big grocery carts full of bats in there and if I wrote my number 3, it could be too confusing. So I wrote 'F--k' Face on it." "After the season was over, in early January, I got a call from our PR guy Rick Vaughn. He said, 'Billy, we have a problem.' And he told me what was written on the bat and I couldn't believe it. I went to a store and saw the card and it all came back to me. We were in Fenway Park and I had just taken my first round of BP. I threw my bat to the third base side and strolled around the bases. When I was coming back, right before I got up to hit again, I remember a guy tapping me on the shoulder asking if he could take my picture. Never once did I think about it. I posed for the shot and he took it. "I tried to deflect it as much as I could. It was fairly easy to say that somebody got me with a joke because people think you're the scum of the earth for doing something like this. The truth is that there's a lot of words like that that are thrown around in the clubhouse. They just don't get out there." "I can't believe the people at Fleer couldn't catch that. I mean, they certainly have to have enough proofreaders to see it. I think not only did they see it, they enhanced it. That writing on that bat is way too clear. I don't write that neat. I think they knew that once they saw it, they could use the card to create an awful lot of stir." "I have no idea where that bat is today. If I were to guess, I would say it probably got lost after someone used it in a game. Probably a guy like Brady Anderson because he choked up so he could use a heavier bat." "Fleer sent me some of the cards out of the goodness of their heart. I autographed them and used them for my gifts to my groomsman in my wedding (which took place that offseason). I figured, at the time, it was better than giving them a set of cufflinks. I think I devalued the cards by signing them though." "When people recognize me, I see the look on their face. They think of the card immediately and, before they even ask, I say, 'Yeah, it was me.' I don't know if it happens daily, but, to this day, it still happens a couple of times a week." There were at least 12 different versions of the card in various states of blackout. First reports estimated that there were about 3,000 cards featuring the full obscenity, but it is believed that there were actually more than 100,000 of them that hit the market. A man named Donovan Ryan has maintained a web site called BillRipken.com, a site that talks just about the card and has been visited about 19,000 times. Today, the Billy Ripken 1989 Fleer obscenity card sells for about $5. The 1989 Fleer card of his Hall of Fame brother still sells for less. Anyone with questions or comments, feel free to email the FF website.